Assignee names in AcclaimIP are normalized. This means that you can search for one version of a company name, such as IBM, and you'll get an inclusive search including over 650 different versions of their name found in the patent database. When you are viewing a patent document in a Search Results grid, it will be the normalized variant of the name. 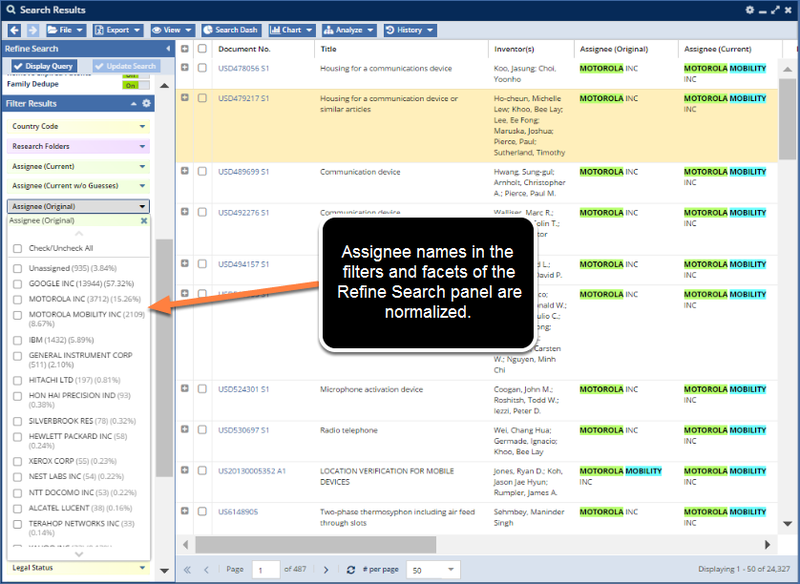 The filters and facets use normalized versions of assignee names. 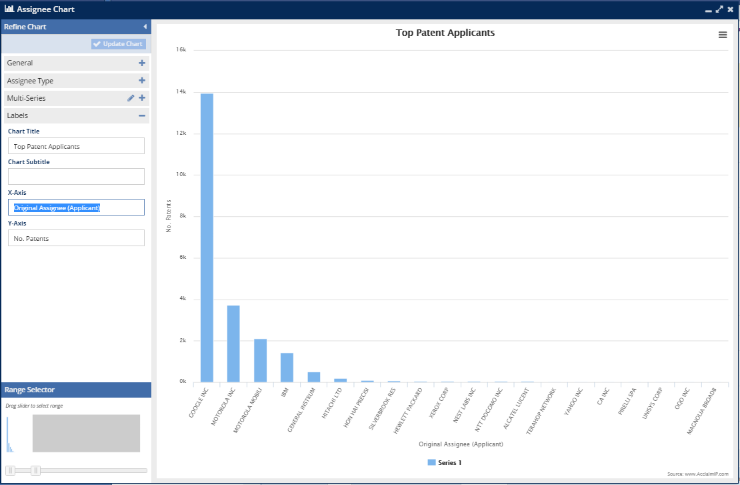 The charts are based on the facets and use normalized assignee names. These cannot be changed (although you can change some of the labels in the chart, such as the labels for the x and y axis). When you choose Export (1) you have the option of exporting five different versions of Assignee names (2), including both normalized and not-normalized variants. You can choose what information you want to export by clicking on the various checkboxes. 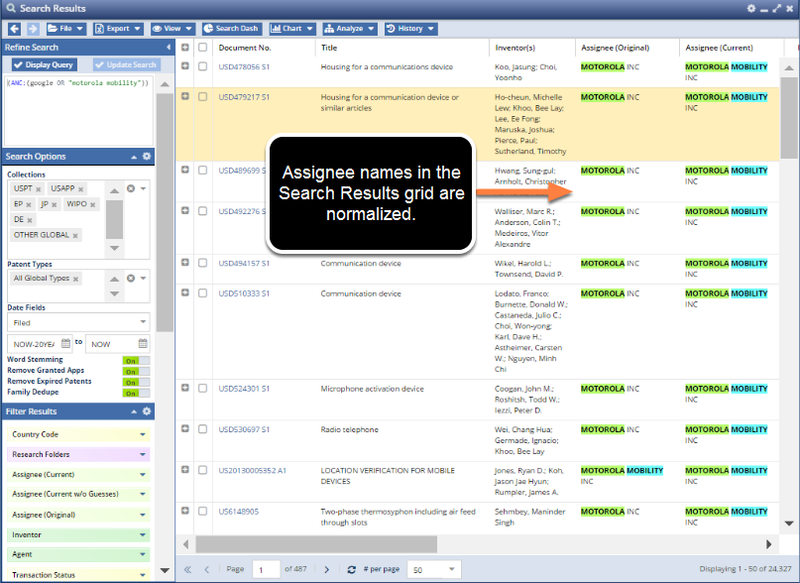 There are specific field codes you can use to search only the normalized variant of an assignee name. ANO --> Field code for the Assignee Normalized Original. ANC --> Field code for the Assignee Normalized Current. ANG --> Field code for the Assignee Normalized Guessed (includes ANC too). AN_ORIG --> Field code for searching un-normalized original assignee. AN --> Field code for searching all variants of assignee names including normalized and un-normalized fields. ANRE_CHAIN --> Field code for searching the entire chain of custody (e.g. ANRE_CHAIN:(JP Morgan Chase)). The Document Details window does contain the un-normalized version in the assignee name fields. The first is the normalized version, and the second (shown by clicking the ellipses) is the un-normalized version. The name in the Assignee Orig. (1) field comes from the patent document itself. The name in the Assignee Cur. 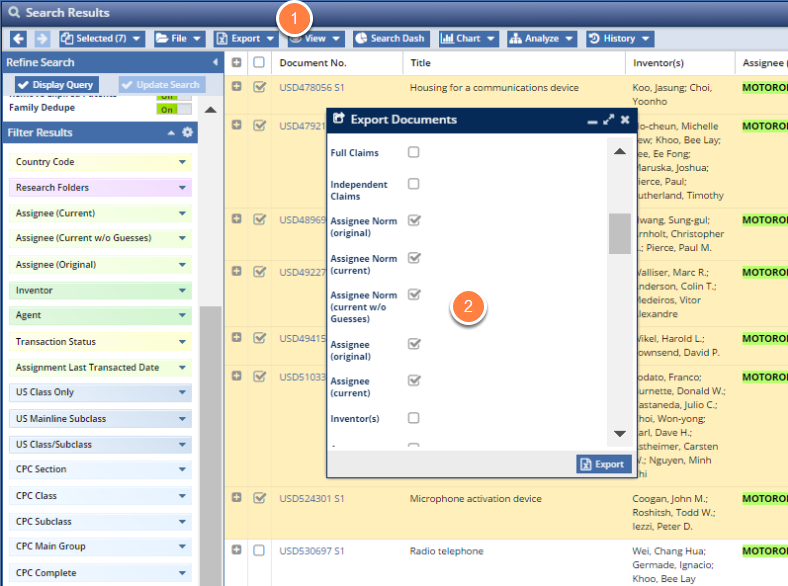 (2) field comes from the Assignments database shown in the Assignments (3) tab. 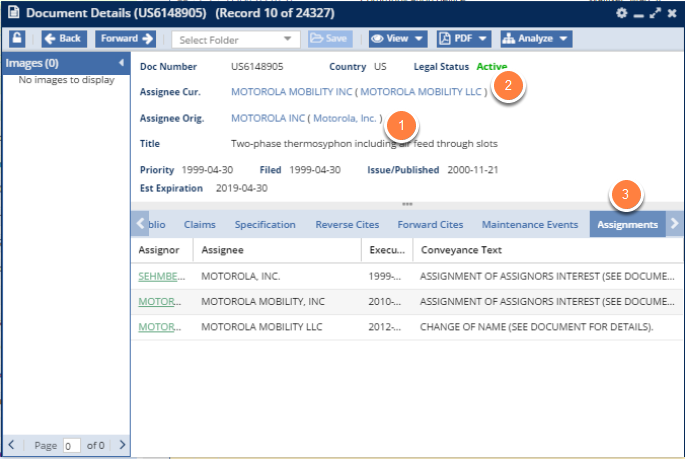 If you were to see this patent listed in a Search Result Grid you would see the normalized variant "MOTOROLA MOBILITY INC" and "MOTOROLA INC." In this example you can see the inventor assigned (in the Assignments tab) the patent to yet another variant of the Motorola name (here "MOTOROLA MOBILITY LLC"). Each week there are thousands of new patent documents published which require more normalization. If you find a mistake, or find a name that is not normalized, just let us know, and we'll work on fixing it. The assignee names are re-indexed and re-normalized on the weekends, so any changes we make won't be in AcclaimIP until the following Monday.